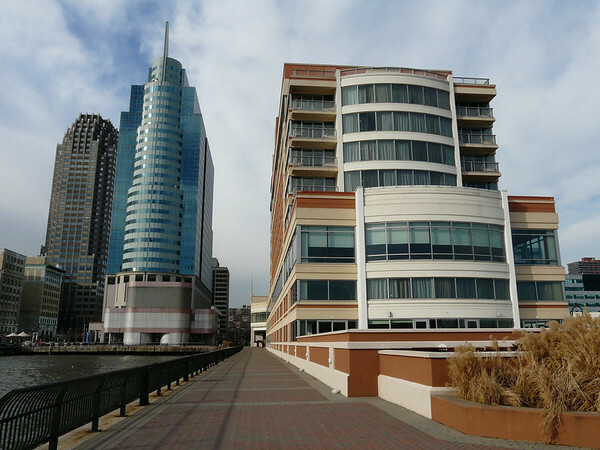 Hyatt Regency Jersey City on the Hudson? Help me decide! I am torn and just need to decide! Have a trip to NYC next April, and will be arriving at EWR around noon on Wed April 6. Wanting to do a points plus cash stay, and won't be at the hotel too much. Going to a Broadway show in the evening and probably out in the city in the afternoon. Originally thought I might do Grand Hyatt but the reviews and posts here steered me away from that, and decided on Union Square since everyone here seems to like it so much. But they don't have points plus cash anymore. I am staying on points plus cash the next night at Andaz Fifth Avenue. Kind of leaning toward the Hyatt in Jersey City, as it's apparently right by the PATH station, and seems to be spoken well of here. It's available for $100 and 7500 points. The other options are Grand Hyatt and Andaz 5th Avenue, which is offering a Large King for $150 and 12,500 points. Would kind of like to check out another Hyatt, since I'm new to the brand, and save $/points, but wondering if I'm missing out by not taking advantage of Andaz 5th Avenue for another night. Location isn't really a deal breaker, as I was already planning on taking NJ Transit/Subway from EWR to Union Square, and I'm fine with taking the PATH into NYC for the one night. Take this with a grain of salt as I've never stayed at Jersey City, but if you are coming from EWR and spending your time in the city, it seems like its going to be a pain to get to. Wouldn't you have to take NJ Transit from EWR to Penn and then PATH back out to Jersey City? I've stayed at most of the NYC properties, except for the PH, Union Square, and Times Square. P+C availability can be really hard to find in my experience, thus the reason I haven't stayed at Union Square. If you are looking for a place to sleep and will be enjoying the city, vs trying to find a top notch full service hotel to spend the time in, I'd actually suggest either Herald Square or the Hyatt Place Midtown South. I've done a few stays this year at Herald Sq. primarily due to the convenience to Penn Station, but couldn't get P+C availability last week and ended up at the HP. I was actually very pleasantly surprised by the HP. Granted that I spent the vast majority of my time out of the hotel, and noticed that the breakfast area was a mad house on the Sunday morning I was there. But, for me, its NYC, there's no way I'd choose a HP breakfast over a good diner or bagel. All in all, my thought process in NYC is mainly around where you want to be in town. I find the GH too big and too busy and the rooms are old. Usually not worth the price for me unless I happen to be going in/out of Grand Central which is rare. Andaz Wall St is fine, but too far out of the way for me in most cases to win out. Since I've been doing quick 1 day trips using Penn to get to/from either JFK or EWR or Amtrak lately, I've been aiming for the properties around there and as much as I like the Union Square area, either Herald Sq or HP Midtown/South are much better location wise and subway access wise to the places in the city that I spend my time. On a side note, if you are looking for food, I had dinner at Union Square Café last week and it was out of this world excellent. Enjoy! I have stayed at the Jersey City Hyatt and it is very easy to get into the city and, if you don't mind a little walking, you just need to take the train into herald square and no transfers are required to go to a Broadway show. As a Diamond member, I'm all in favour of moving from hotel to hotel when travelling light and picking up another 1,000 points amenity bonus for each stay. New first-time hotels is also good for the Milestones program, although there's no guarantee of being targeted for each milestone. I echo the comments that for Broadway/Midtown, it's no big deal to take the train from New Jersey as opposed to staying downtown. Thanks everyone! I appreciate the input. I feel better about going with Jersey City. Transportation should be fine. I think I can take NJ Transit to Newark Penn and then PATH to Jersey City. Not a big deal since I would have been taking NJ Transit to NY Penn and then subway, if staying in NYC. Thanks to bostonpilot for the Union Square Cafe suggestion, I will be sure to check it out! Glad to hear you liked the HP. I am actually staying there the Fri/Sat of my stay. I'll be taking the LIRR out of Penn Station early on a Sat morning, so wanted to be close. Agree with you on breakfast.. free is nice bonus, but with so many options in NYC don't care too much. The Hyatt is on the right here. The PATH station is the short building to the left of it. More photos in the hotel gallery linked below. Thank you Tom! That's really helpful. I stayed in Jersey City earlier this year, but it was around 5 blocks from the PATH and freezing cold in January. This will be much more convenient. Consider taking the NYC water taxi from the Hyatt Jersey City as the ferries arrive right by the hotel. Mix it up a bit so you don't have to take the PATH every day. Also, the views at night of Manhattan are awesome! I'm in NYC often and I'd rather be in the city than looking at the city from Jersey. Going back and forth into Manhattan on PATH is a pain, and there is nothing like walking out your hotel front doors and being in the heart of it. Thank you both! I will actually only be in Jersey for the one night and the rest of my trip will be in NYC. Thanks for the Water Taxi suggestion. Sounds like something different to try! I called HGP yesterday to inquire about using a DSU here in March on a per-existing booking, I was told that nothing was available. Strangely the Hudson River Suites are showing as available for all three nights of the stay. DSU's do book into the Hudson River Suits normally, right? I really should know this but is DSU Inventory < Actual Suite Availability? I'll probably HUCA and its not a big deal. Unfortunately I have been unsuccessful on my last three attempts to use my DSUs, all for off season stays and I have always had very good success in the past. EDIT: HUCA got me the successful upgrade. I stayed at the Hyatt Regency Jersey City on the Hudson for the first time two weeks ago and I very much enjoyed my stay. I decided to arrive a day early for a weekend stay in Manhattan and as many know, Thursdays during busier times can be pricey. A few days prior to my stay availability opened up for Cash and Points at the Hyatt Regency Jersey City and every time I see when I walk along the Hudson (my Manhattan home away from home is the Conrad New York right across from it) I have thought to myself “I bet that has great views” so I booked the cash and points and called to see if I could apply a DSU (Hudson River Suite), which was available and while only one day, it was totally worth it. In fact, it was one of those stays where you can’t believe it took you this long to try the hotel out. I had taken Amtrak up to Penn Station and walked over a block to the PATH (which takes the subway Metrocard so no special card/fare needed) and took it to Newport where I transferred to and got off at Exchange Place. The escalator entrance to the PATH is make 75 yards from the front door of the Hyatt. Sidenote - it is a longer, steeper escalator than average, about half way up with my big garment bag spinner and big portable office on top, I was certainly thinking I probably should have taken the elevator as I could visualize it knocking over the few people behind me like pins in a bowling lane). The best part of this hotel’s location is it jets out into the Hudson and the hotel is built such that most of the rooms will have decent views. I arrived at 1 PM and my suite was available to I was able to get situated and then grab a quick lunch in the restaurant which as you might assume has great views. The food was very good (I especially liked the spring pea soup, so much I had it for dinner again) as was the service, prices were also relatively reasonable (a nice feature of not being in Manhattan). The Suite is on the 4th floor but is very spacious and has a terrace balcony with an amazing view. The next morning, I had breakfast in the restaurant and had the corned beef hash, which was frankly disappointing (felt more like shredded beef than corned beef) considering how much I enjoyed lunch and dinner. It turns out not only is the PATH right next door but the Exchange Place ferry stop is a short walk (less than a quarter a mile). For $6 took the ferry to the World Financial Center ferry stop which is a half a block to the Conrad New York where I was staying for the weekend. To summarize, I highly recommend and will certainly be back, especially considering how easy it was to get back and forth to specifically where I wanted to go in Manhattan. Amtrak access is even easier if you detrain in Newark Penn and hop on the PATH train there (which is inside the station). That PATH train will take you to Exchange Place without a transfer. Thanks, when my Amtrak train stopped at Penn Newark I did notice the PATH trains and I was thinking getting off there in the future would probably be much easier (not to mention carve off a lot of time). Unfortunately I was not ready to get off the train at that point. Definitely a conveniently located hotel if you are Amtraking to NYC. FWIW, an Uber from Newark Airport is like, $22. It's not even worth taking the train if you're travelling with others. I live a few blocks away.